Ask someone today if he or she likes Jesus, and the answer is usually Yes. But ask if that person likes the Church, and chances are you will get a far less favorable response. Led by author Dan Kimball, this six-session small group DVD will help you explore and respond truthfully, caringly, and engagingly to the most common objections and misunderstanding culture has about the church and Christianity. 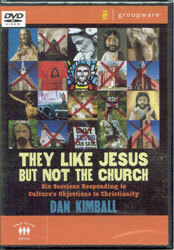 Through interviews with those who like Jesus but not the church and teaching by Dan Kimball, this video-based curriculum will help address these objections. Includes discussion questions and resource listings. Dan Kimball is the author of several books, including The Emerging Church and They Like Jesus But Not The Church (Zondervan). He is one of the pastors of Vintage Faith Church, a missional church planted for engaging the post-Christian culture in Santa Cruz, California. He is adjunct faculty at George Fox Evangelical Seminary. He has served on the boards of Outreach magazine and Youth Worker Journal. Dan is married to Becky, and has two daughters. Is the Church Negative, judgmental and Political? Does the Church Restrict and Oppress Women? Do Christians Arrogantly Think All Other Religions Are Wrong? Are Christians Fundamentalists Who Take the Whole Bible Literally?